A diode is said to be an Ideal Diode when it is forward biased and acts like a perfect conductor, with zero voltage across it. Similarly, when the diode is reversed biased, it acts as a perfect insulator with zero current through it. The V-I characteristics of the Ideal diode are shown in the figure below. An Ideal diode also acts like a switch. When the diode is forward biased it acts like a closed switch as shown in the figure below. Whereas, if the diode is reversed biased, it acts like an open switch as shown in the figure below. A Real diode contains barrier potential V0 (0.7 V for silicon and 0.3 V for Germanium) and a forward resistance RF of about 25 ohms. 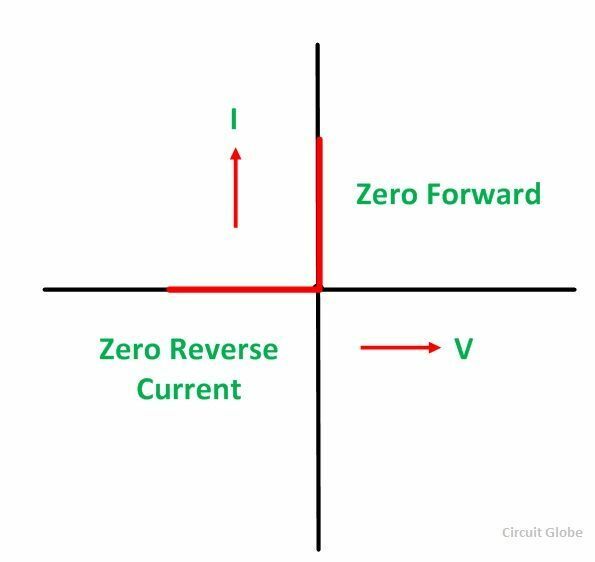 When a diode is forward biased and conducts a forward current IF flows through it which causes a voltage drop IFRF in the forward resistance. 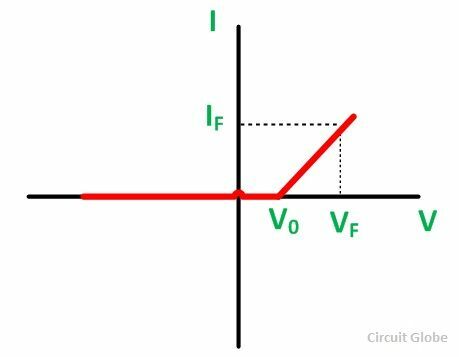 Hence, the forward voltage VF applied across the real diode for conduction, has to overcome the following. For Silicon diode, the equation becomes as shown below. The V-I characteristic of the Real diode is shown below. For all the practical purposes, a diode is considered to be an open switch when reversing biased. It is because the value of reverse resistance is so high (RR > 100 MΩ) that is considered to be an infinite for all practical purposes. The equivalent circuit of the real diode under forwarding bias condition is shown below. In real diode we dont get the exact V-I curve like that of ohms law, In F.B region current rises exponentially.. which one is correct??? Both the statements are correct. The forward-characteristic curve of the real diode is not entirely linear like ohms law. This happens because of the depletion region between the p-type and n-type material. The forward-characteristic curve depends on the number of electrons passes through the depletion region. The forward voltage decreases the width of the depletion region concerning which the exponentially rises characteristic curve obtains.